Aside from out west, I have NEVER seen a Bald Eagle locally and have lived all my like within either Barrie or Collingwood area. Midhurst is a village of about 3,000 3 miles directly north of Barrie. On Monday, Nov.7 @ 1410 I was loading winter ballast sand bags into the box of my truck. It was a bright, sunny day & 60 F.
I saw what I at first believed to be two Turkey Vultures circling over our house, perhaps 300 feet up. Then when they turned a certain way the snow white heads and tails confirmed Eagles. I ran into the house, grabbed my binoculars & confirmed the sighting. They slowly circled in a gyre for 5-6 minutes and then headed east out of sight. On Saturday, Dec. 3rd at 1034. It was 32 F & there was light intermittent snow. I was one mile south of our home in my truck & saw another Bald Eagle directly in front of me. He/she was 200 feet up & generally following the contour of Willow Creek. 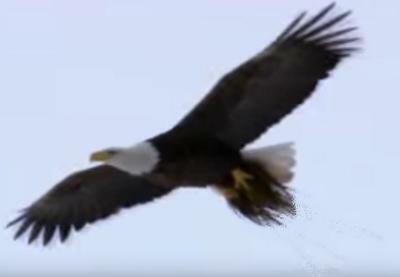 Thank you for sending us this report about your Bald Eagle sighting!